Tissot presents a classic timepiece that features heritage swiss-design. A stainless steel case houses a black dial that is marked with classic roman numerals and secured with a bracelet for stylish, everyday wear. 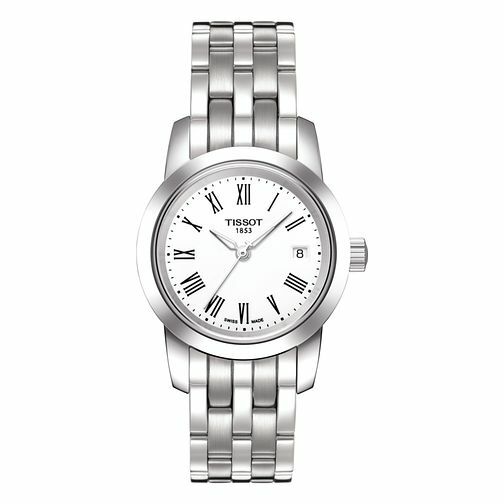 Tissot Classic Dream Ladies' Stainless Steel Bracelet Watch is rated 4.0 out of 5 by 2. Rated 3 out of 5 by Anonymous from Product great...gift wrap poor Received item...wife was pleased...quality product. Requested item to be gift packaged with message.... Not sure what I was expecting...received bag and no message which spoilt the wifes surprise. Rated 5 out of 5 by Anonymous from Lovely watch This watch is lovely, looks nicer in reality than it does online. Very smart and great value as the quality is very high. I would highly recommend!